I spent most of my youth taking things apart just to see how they worked – sometimes managing to put them back together. I welded my first bicycle frame when I was 12 years old. My father told me when I was young to follow my heart, and the money would follow. My success and my satisfaction in this life have largely been the result of my continuing quest for new projects and new challenges, and my insatiable curiosity of everything. I have built my career on following my passion for all things mechanical, beautiful and challenging – so I suppose it was inevitable that I would fall in love with Albert. Albert is a remake of a 1919 Excelsior OHC boardtracker and is one of ten bikes that will eventually be produced by Paul Brodie in his modest Vancouver shop. In 2004, Paul was looking for “something big” as a project to sink his teeth into, and while walking a vintage swap meet, he stumbled across an old set of engine cases from a 1910 Indian single. 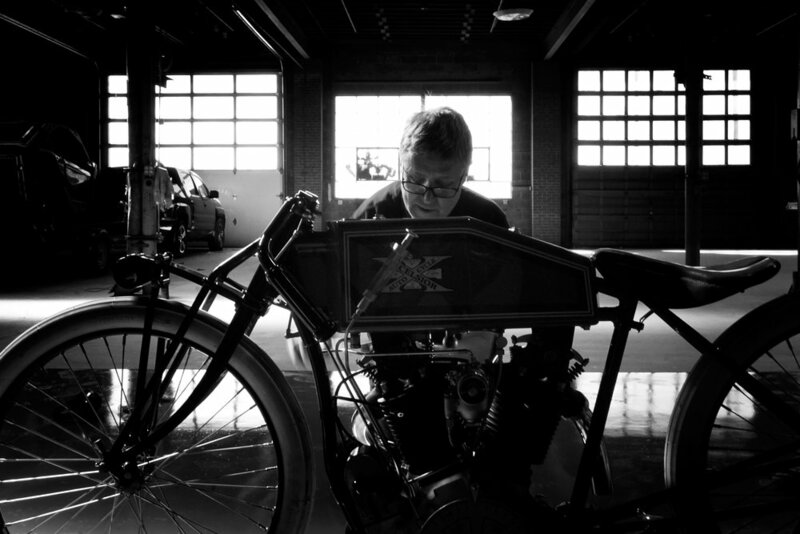 He was struck with the idea of building a replica racer and set upon researching bikes of that era. He soon learned that one doesn’t just build a boardtrack replica without stepping on the toes of people who restore and curate the few originals that still exist, and with that realization Paul set his sights on remaking a bike that no longer existed: the Excelsior OHC. Excelsior had been racing for years but was long the underdog to Harley and Indian. A few people within the company had secretly been working on a new overhead cam engine to beat them both, and this new engine made its first debut at a race in early 1920 at Ascot Park in L.A., California. Before the race began, engineer and factory rider Bob Perry wanted to show just how potent this new design was, and he set about taking a few hot laps before the race. To everyone’s amazement, he reached an estimated speed of 95 mph, which was faster than anyone had ever gone around this track. What he didn’t realize was that with all the fanfare of showing this new bike, the rear wheel axle had not been properly torqued. Less than two laps into his run the bike came apart, and Bob slid into the side rail, instantly killing him. Ignaz Schwinn, the founder of Schwinn Bicycle Company and owner of Excelsior motorcycles, thought of Perry as a brother and was devastated upon hearing of the crash. Ignaz ordered all four race bikes smashed and buried and the race team dissolved. The OHC was gone almost as quickly as it had emerged, and the Excelsior name would never race again before closing its doors permanently when the Great Depression hit. After learning of Paul and Albert through a good friend, I made a call to Canada and spoke with the man himself. It was an awkward and brief conversation, but not long after I found myself the proud new owner of a motorcycle – the last of the first 4 bikes he built. Little did I know that in acquiring Albert, I was also starting what would become a friendship of like minds and shared ambitions. Paul Brodie is a kindred spirit. He welded his first minibike frame when he was 12. He is passionate and has an insatiable curiosity for all things mechanical – a true Renaissance man and engineering enigma. He is a designer, fabricator, artist and racer. He is both spiritual and mechanically minded. He is fearless yet patient. His name as a builder of mountain bikes ranks among other pioneers such as Gary Fisher and Joe Breeze. 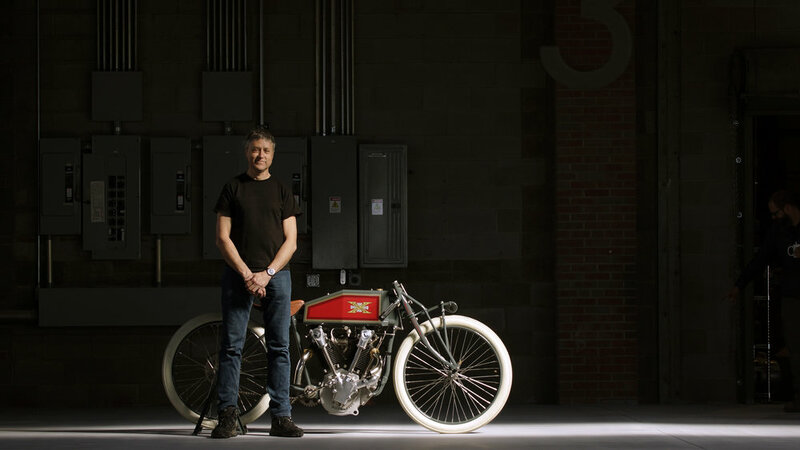 He has built his own vintage race bikes and competed with them, he has built his own motors from scratch, and he has done all of this with impeccable attention to detail and craft and without the slightest hint of bravado. He’s polite, soft-spoken, and often only speaks when spoken to – or when he sees that you, too, are passionate about something. You might think that he doesn’t have much to say, until you see his work. Only then do you appreciate the volumes he speaks. Albert is a stunningly beautiful creation. It is possibly the most beautiful machine I have ever seen. One must see it in person to truly appreciate the level of detail and care that has gone into every component of this complicated and antiquated artifact. When you hear the phrase “hand-built motorcycle,” you might think of a bike that has been cut and welded, a custom seat, custom tank and maybe a rebuilt engine with tig-welded headers. 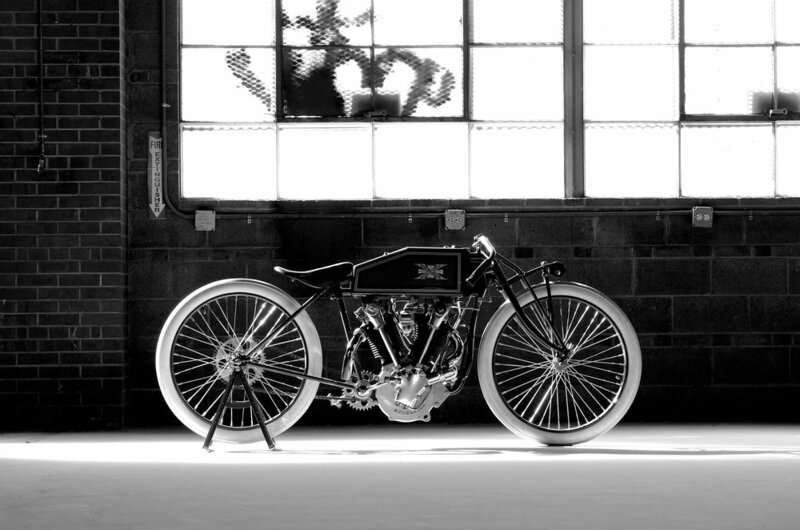 Albert redefines what makes a handmade motorcycle. With the exception of the tires, rims, spokes, pedals and magneto, every part of Albert has been designed and fabricated, tested and finished by Paul, with the occasional help from a few passionate friends. Sitting on a lift in my shop, I have gazed at this bike for years now, and each time I stop to look, I notice something new. A small hand-turned screw on a throttle linkage, a one-off brass cam on the carburetor body, a perfectly machined castellated nut on the rear hub that firmly holds the pedal sprocket – one of the few vestigial indicators of its origins as a commercial motorcycle. All of these details amaze me and remind me of just what this bike was built to do – both by its original designer and by its inherited creator – and of just how much thought and passion went into realizing this vision. Brodie built this bike much in the same manner it would have been made back in 1919. The creation of bikes of this period were very much driven by – and limited by – manufacturing techniques of the time and the passion of a few guys with unwavering drive. In a way, re-manufacturing a vintage bike like this is more accessible to a modern builder. Gravity casting was very common back then and is something you or I can do today with minimal cost. Just as was done back then, a designer could readily bring an idea to fruition with little more than the desire to make it happen and the skills to know how to do it. Paul Brodie made it happen, and he started with the engine cases. He drew them by hand at full scale and sent those drawings to Pacific Pattern, then over to Globe Foundry where they cast the aluminum parts. Similar techniques were used for casting the frame lugs and cylinders (cylinders and heads were cast as one piece back then because we hadn’t yet figured out how to make a reliable head gasket). Other cast parts include the carburetor, fork linkages, control rod linkages, fuel petcock and intake manifold. All of them impeccable and gorgeous on their own. Parts that could be made on a mill or lathe were cut from billet, such as the hubs, drive gears, sprockets and all (yes, all) fastening hardware. You can’t just go buy hardware for a 1919 boardtracker, so Paul made all of the nuts and bolts for this bike by hand, and they are the most beautiful bolts you likely will ever see – each perfectly and consistently cut and chamfered on every edge so as to reflect light perfectly. Much like the founders of Harley, Indian and Excelsior, Paul has accumulated substantial experience in the design and fabrication of lug-brazed bicycle frames – and so building a lug-brazed motorcycle frame was a natural evolution, if not an unavoidable eventuality, for him. In addition to drafting the frame layout and bending the main tubes, Paul also carved the patterns for the lugs. The lugs are the business ends of the frame and include the head tube that carries the fork bearings, the bottom bracket for pedal crank bearings, the dropouts that the rear hub is bolted to, and every other point at which one frame tube joins another. Tig-welding didn’t exist in 1919, so lug-brazing was the most common and most reliable technique for building steel-tubed frames. It works well and is still used today. Working from just a few old photos – and only of the right side of the bike – Paul had a lot of guessing, experimentation and reverse-engineering to do. He could calculate the angle between the engine cylinders, but he couldn’t see what was going on inside the engine – or on the other side of the entire bike. Through trial and error and hours of research, he had to work out cam gear angles, oil circuits, ignition timing, carburation and every other aspect of what makes a great engine – albeit a 98-year-old design. The cylinder heads alone took months to decipher, and Paul used Bondo and scrap metal to craft models of the cylinder head layout just so he could get his own head around how best to arrange all the parts that had to live in that small space. As if this wasn’t challenge enough, Paul was working with 100-year-old technology. There were no exploded views of this bike, no jetting charts and no shop manual with tips on what angles to cut the valve seats at, or what the ideal compression ratio is. Albert has a carburetor that looks and operates like nothing else you’ve seen. Nothing else on the bike is ordinary, either. After staring at this bike for three years, Paul realized that the time had come for it to be started and ridden. Forever dedicated to his creation, Paul had promised to come to Denver to help start Albert for the first time whenever I was ready. So after a morning of test and tune at the shop and fixing a sticky float valve, we drove two hours to a dirt track outside of Castle Rock, Colorado, for some laps. The experience was amazing and exhilarating, but the realization of just what this bike is – and of what a boardtrack race must have been like – became more real than ever for me, and was overwhelming. On the track the bike is a handful. It demands all of your attention. With a good push from a few friends, Albert comes alive and pops off down the track like a big string of firecrackers just lit. The gearing is so tall that the first few seconds havethe motor turning at a speed so slow you can count the RPM on one hand – crack … crack … crack – eventually building to a growl, and then a 1000cc bark will catch you off guard if you aren’t ready for it. Where today there would be invisible electronic ignition, there is instead a magneto that must be manually advanced by a left-hand twist grip – all while still also working the right-hand throttle. Where you would normally find a clutch and brake lever, there is nothing. There are no brakes, no clutch, no transmission, no starter, no speedo and no kill switch. The bike is either on or it’s not. You have a control via a throttle that is akin to reins on a pair of runaway horses. That’s it. There is a ring on the carb that needs turning to adjust air mixture once you’re up to race pace, and there is an oiling plunger that needs an occasional push to keep the engine from seizing under wide-open throttle. The original OHC likely had a total-loss oil system, which meant that all the oil that circulated in the engine eventually got spit out the top end, and the oil tank would eventually run dry just like the fuel tank. This expelled oil went everywhere – including onto the track, and is just one more reason why boardtrack racing was so deadly for so many. Back at the shop, Albert again rests peacefully on his lift. Wiped clean of dust, debris and spent oil, all evidence of the track experience is now gone. What remains is pure form-follows-function design. It is machine aesthetic in its most honest form. There is nothing on this bike that doesn’t serve a purpose, no plastic covers or chrome bits or fancy paint. And yet every component – every bolt – is inarguably beautiful both on its own and as a whole. This bike’s timeless beauty and lasting appeal comes from it painstakingly perfect fabrication, and from its pureness in being designed and built to do a specific job – and do it beautifully. We are lucky to have builders like Paul Brodie to carry on this craft, creating masterpieces like Albert, and through his work and that of other kindred spirits, this passion will continue for another 100 years – we can only hope.